If the LG Joy comes in at a super-low price it might be worth picking up for some but it is missing some key features and has a poor design. LG unveiled four new mid-range phones for its 2015 selection a couple of weeks before MWC, promising the handsets would be on show there. The company made good on its promises and we've managed to get a hands-on look with the Magna, Leon, Spirit and the Joy. LG's Joy has the lowest spec of the entire range and it doesn't come with any stand out features to shout about. So far there's no price for the LG Joy, which makes it difficult to place in the market and judge whether it'll be worth the cost as the price is a main selling feature. The LG Joy features 4-inch WVGA display with a pixel resolution of 480 x 800 and a pixel density of 233ppi. Scrolling through the pages really showed how dated the resolution looks compared to other LG products meaning video isn't going to look good here. The handset is small and thick coming in at 11.9mm high. If you're used to a slim handset like I am you'll be in for a bit of shock when you try and fit this thing into your pocket. Here's how it looks next to the LG G Flex 2, a truly beautiful looking smartphone. There is a slight grated effect on the back of the handset to give better grip to your fingers whilst the edges are more rounded but it does all round feel you're using a small brick of a phone. The power button sits on the right hand side of the handset which is a strange one for an LG phone considering we are used to it on the back, while the other side of it sits the volume rocker. Along the bottom sits four different navigation buttons for moving around the phone but I found some weren't reactive to the initial touch and had to be pushed a few times to really work. The biggest benefit is the LG Joy comes with Android Lollipop as standard, meaning the latest and greatest Android software is running on the handset. This has to be one of the cheapest handsets with the software on and it is a surprise LG has not decided to launch it with an earlier version of Android KitKat on board. 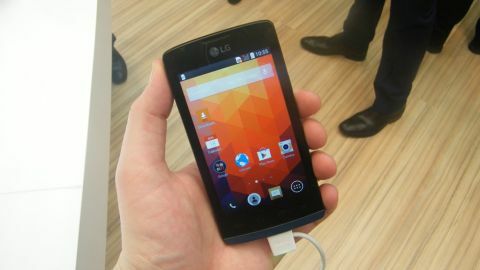 There are two different versions of the LG Joy, one offering 1GB of RAM with 8GB of internal storage and a quad-core 1.2GHz processor. The other comes with a dual-core 1.2GHz processor with 512MB of RAM 4GB of storage. Both phones have space for a microSD card so storage can be expanded up to 32GB. On the rear is a 5MP camera that seemed better than expected in our brief time playing around with it while the 0.3MP front facing camera was one of the poorest I've used in a long time. The handset is what the company calls "selfie stick friendly" with gesture control to take those snaps really quick but with such a poor quality shooter on the front you're not going to find yourself using it all that much. It's also only 3G compatible meaning you're not going to be able to slap in a 4G SIM card and get some superfast internet. It isn't really expected at this range but the LG Joy will date very quickly. The price is going to be the deciding factor here. We know it is going to be cheap but it'll have to be one of the cheapest mid-rangers available to justify the amount of features this handset lacks. The display isn't strong at all and paired with a cruddy design it isn't a recommendable handset. If you're going to pick up the LG Joy it almost goes without saying to pick up the higher version with more storage, a slightly better processor and more RAM for your buck. Once we know the pricing of the handset we'll be able to give you a much better verdict but until then we're going to have to wait.